Back to fractals. I think I did something to the other machine. It’s leaking oil, or something. I smell something “electrical”, too. My seven year-old daughter was recently invited to a birthday party. While we were looking around in the Barbie Doll aisle of a department store for a suitable present, me and my nine year-old son came across a misplaced item –TEST-TUBE ALIENS. I can’t imagine who would put down a kit for “making” aliens in a test-tube and choose a Barbie doll instead because my daughter soon shared our interest in this hand-held Easy Bake oven for mutants. Some poor girl must have gotten a Barbie doll after her mother intervened and told her she’d probably have a lot more fun with a glamour pageant Barbie doll than the TEST-TUBE ALIENS that she picked up on the other aisle (where all the exciting, boy’s stuff is). My interest in the TEST-TUBE ALIENS subsided somewhat after reading on the back that there were three or four different kinds, and they all had pre-detremined names — and predetermined shapes too, it seemed. That’s no fun. I was expecting something more along the lines of a genetic experiment with such scrambled genes that the back of the box would only speculate on what they might look like and offer a guarantee that what crawled out of the test-tube wouldn’t threaten the human race with extinction. Ideally, it would also have come with a small handgun for terminating the experiment should things get out of hand… chains break, radio-activity be detected. Guys like me won’t be designing children’s toys anytime soon. 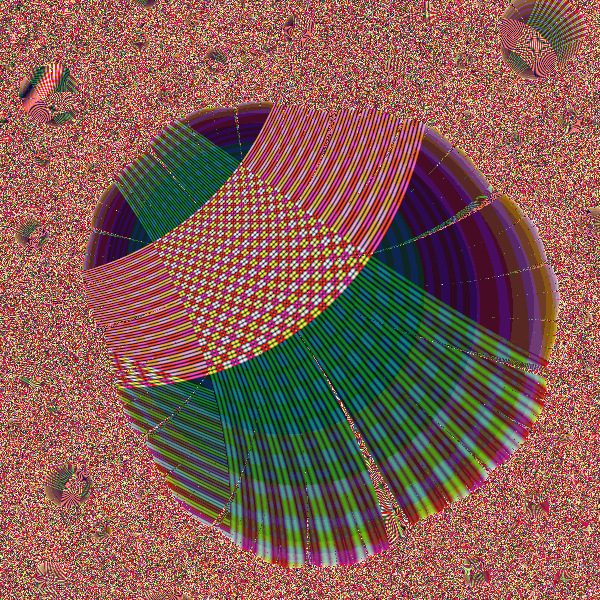 Fortunately fractal programs are also test-tubes — digital ones — and have very few restrictions on them, which makes for hours and hours of frightening recreation. The results aren’t always pretty, but for the mad scientist in the family, they are rarely boring. What? Did I go too far again? Well, it does seem to be a popular calendar, and even if it isn’t, what’s wrong with people liking a type of artwork that’s different from yours? Alright, sure, folks Christmas shopping in the mall might “like” that sort of thing, or at least buy it, which isn’t really the same thing as saying they think it’s great artwork… but it’s incredibly cliche isn’t it? 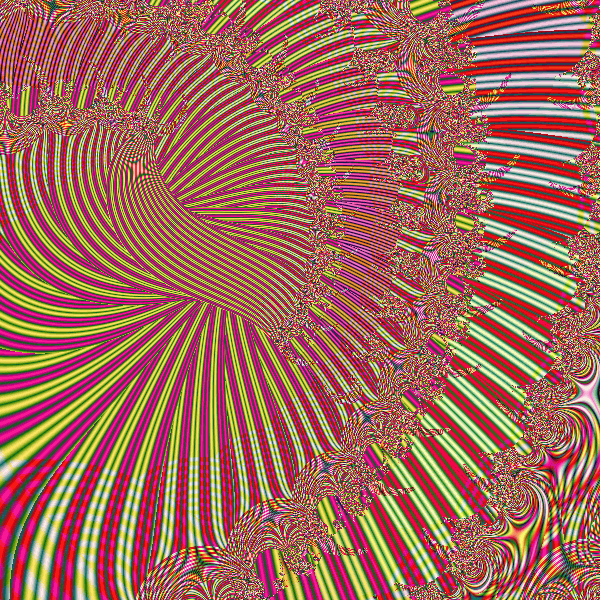 It makes fractal art look like it’s nothing more than a children’s pin-wheel display. That’s not “arty” artwork. “Arty artwork”? Sounds like some new animal species. I think you’ve become a test-tube experiment yourself, man. Maybe you should have a warning label. Hey! You’re just my conscience. You’re not suppose to insult me. You’re supposed to act like Jiminy Cricket and give gentle advice and reminders, like when I’m totally wrong and steadily slipping into a muck hole of depravity. Alright. Sorry — sorry for having a sense of humour! But back to your impolite comments about the Fractal Universe Calendar; I’ll try to be more Jiminy Cricket-like. I find the calendar’s choice of artwork to be a profound statement of time and very appropriate for what really is the current state of fractal art. No, I’m serious. Every year, the same old stuff, reworked by a few people and slapped with a new label: 2005; 2006; 2007… In the words of Samuel Becket, I think, “Nothing ever happens”. You see? That really is the current state of fractal art: a handful of people doing the same old thing every year. Hmmnn. That’s quite interesting. I didn’t think my conscience would ever come up with anything so cynical! You’re having a bad influence on me. I’m going to ask to be reassigned. Your analogy of the mad scientist as the true experimental artist (one who brings life, in the case of Frankenstein) played against the barbified art of the UFractalus school is pertinent. Like Barbie herself (whose bust is so big compared to her body proportions that she’d fall flat on her face if she were a real woman) the FU fractals are presumably “perfect” — but absolutely drained of life and glossed to petrification. They are, like Barbie, attractive but ultimately a hollowed-out, plastic surface. As Guido Cavalcante noted earlier on OT, it’s no longer “heroic” to be satisfied with making such work. I remember the controversy when Teen Talk Barbie used to say: Math class is tough! But, apparently, it’s not as hard as art class.